Wow! It’s been a FULL-ON year for the Quinta! I don’t think we’ve ever been so busy and the best bit about it was the amount of past guests returning again and again – I think the winner must be Sheila who’s racked up thirteen visits, but she’s closely followed by Calum and several others, and it’s been a rare week when we haven’t had at least one or two couples staying who’ve stayed before. It’s a great, great feeling to be running the place with this amount of positive feedback, so my thanks go to all you who’ve come and stayed here over this season – and we look forward to seeing you again in the future! We seem to be becoming known in the “Retreat” market as well – so much so that we’re going to have another website soon called “www.retreat-in-portugal.com”, so watch out for that one. 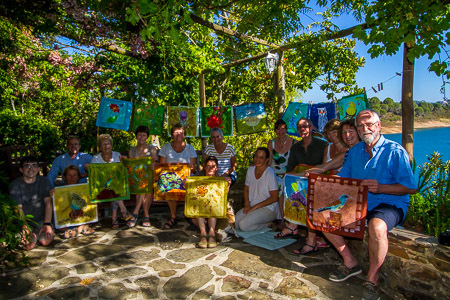 Marie Therese King is running her “Batik’n’Birding” week again in a few week’s time, and there’s still a room free so if that’s your bag, (and with the weather we have at the moment it’ll be fantastic! ), get in touch with her soon. Talking of Birding, since February there’s rarely been a week when we didn’t have an excursion but the Spring Birding Season was especially busy, and in June we closed the Quinta for five days to give Daniela and I a break. Daniela took the opportunity for some pampering with her parents and Elias in Vienna, and I, well I of course went birding! Des took me off to the Farne islands where we had a blast, (you can see some of the pictures we took here), and it took weeks before the smile was wiped off my face. 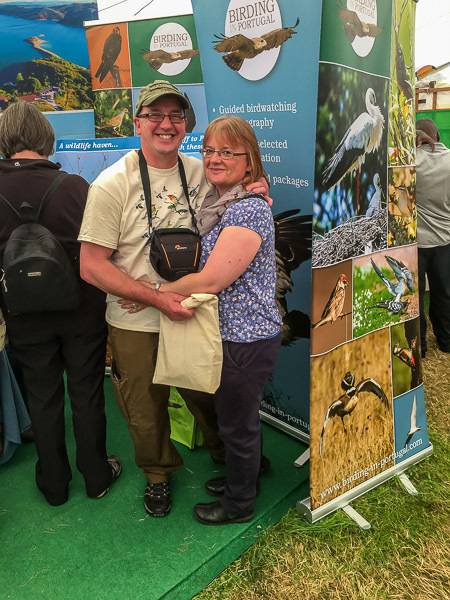 Then it was the summer and it was busy, busy, busy (with the Birdfair in August as well, where we once again donated over Â£500 towards their conservation efforts worldwide), and now … well, the Autumn migration’s begun and we’re straight into it as it seems to be an early kick-off this year. 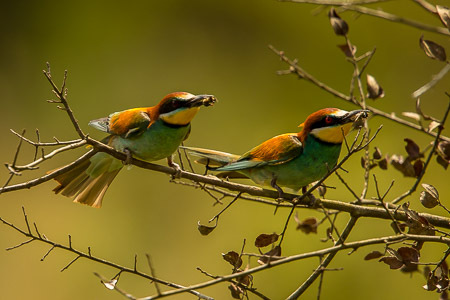 European Bee-eaters doing what it says on the tin! Our Bee-eaters, normally so punctual, left at least 5 days earlier than normal and I saw our first Northern Wheatear coming through before the end of August, which is again early. Speaking with Archie this morning – he’s running a chateau in the south of France this summer – he said he’d noticed it too, with large movements of Rollers and raptors noticeable every day heading for the passes through and around the Pyrenees. We drew the raffle last week but nobody’s claimed their prize – it’s surprising how often it happens, so we’re going to send out an email to everyone who entered as a reminder and draw it again on the 16th September. That’s what happened last year and we’re looking forward to welcoming Kenny & Chris, last year’s second week’s lucky winners, who are coming over next month.